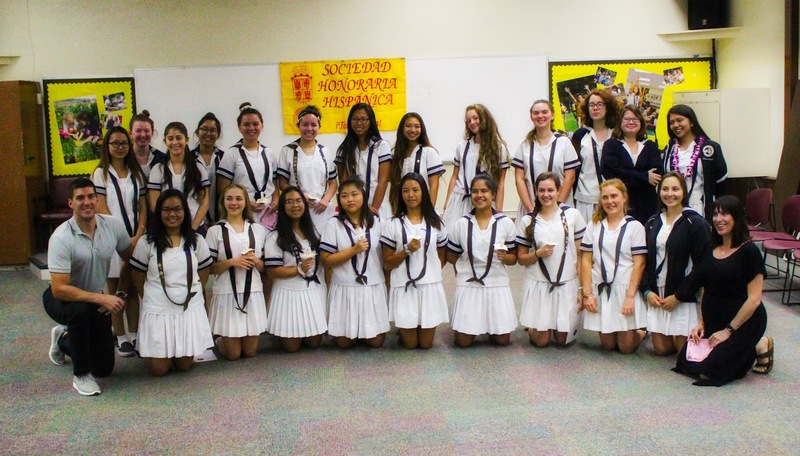 On Tuesday, April 24th, 12 new members were inducted into Sacred Hearts Academy Chapter of the Sociedad Honoraria Hispánica, a national honor society for students of the Spanish language. The new members, the majority of whom will continue on to take Advanced Placement Spanish, have worked diligently over the past three years to earn a place in the society. Teachers, Keeley Ohman and Sean Rist, applauded the high degree of compassion and discipline exhibited by these students and remarked that they could not be more proud of their efforts with the Spanish language. Mahealani Sims-Tulba, '18, was one of four Hawaii high school students to win the Soroptimist International Violet Richardson Award. The award recognizes young women ages 14-17 who are actively engaged in volunteer action within their communities or schools. The award particularly highlights young women whose volunteer work make the community and world a better place. Mahea created her own foundation, B.R.A.V.E. Hawaii (Be Respectful and Value Everyone), in addition to authoring and illustrating "It's Okay to Be Different". B.R.A.V.E. Hawaii focuses on anti bullying teachings and practices through school visits across the state. Through her foundation, Mahea continues to strive to bring awareness to the topic of bullying and stresses the importance of being kind and respectful, goal setting, personal development and motivation. Sacred Hearts Academy's student newspaper, Ka Leo, was named 2nd Best Newspaper in the State at the 2018 Hawaii High School Journalism Awards! Taking home additional Best in State top awards for the Writing and Photography divisions among a total of 14 First-Place awards. 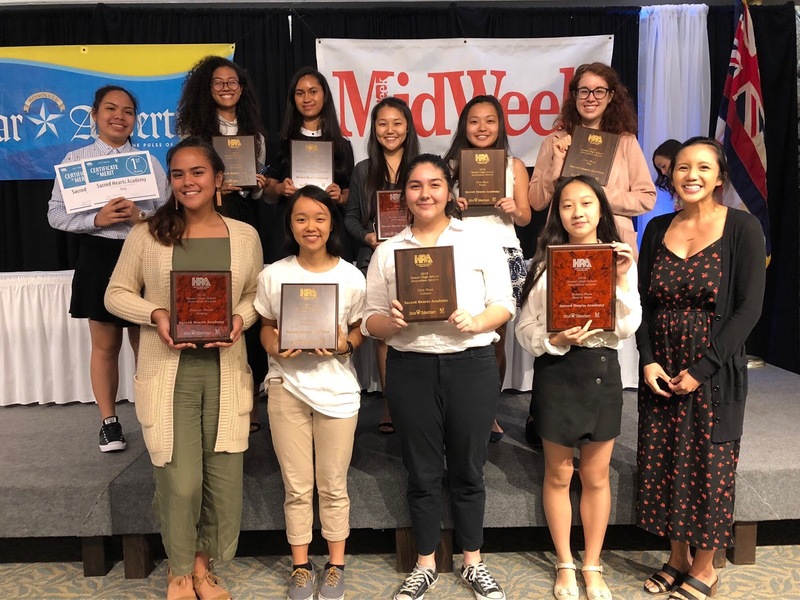 Ka Leo staffers competed against both public and private schools in 22 different categories, receiving First in State awards for Profile, Column, Blog, Photo Essay, Infographic and Multimedia; with Ka Leo News Editor, Shelby Mattos, '19, being named a Most Valuable Staffer. What a beautiful team effort! Congratulations, Jenelle Ho, Lucinda Hu, Grace Kim, Jasmine Matsumoto, Shelby Mattos, Taylor McKenzie, Rebecca Meyer, Noe Nekotani, Martha Nicholas, Jalen Tam, and Mrs. Alyssa Myers, SHA Ka Leo Advisor. Way to go ladies! 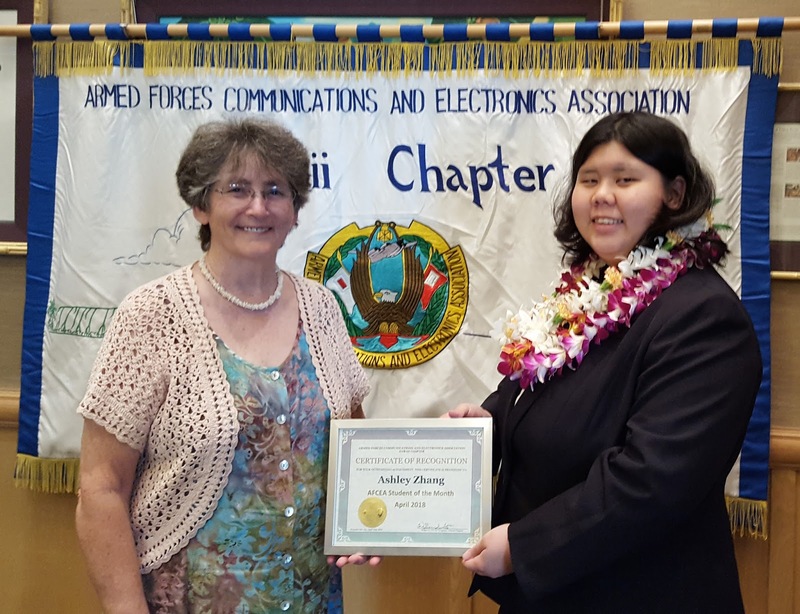 At the April meeting of the AFCEA Hawaii Chapter (Armed Forces Communications & Electronics Association), Ashley Zhang, '18, was recognized as Student of the Month April 2018. Ashley was recognized for her work in cyber security, computer science, and her enthusiasm and positive character; and was treated to a delicious luncheon where she was presented with a certificate, lei and $100 award. AFCEA is a 501(c)(6) non-profit international organization that is dedicated to increasing knowledge through the exploration of issues in information technology, communications, and electronics for the defense, homeland security and intelligence communities. They are strong supporters of education in Hawaii and their Educational Foundation provides significant scholarships each year to military veterans, ROTC students, and STEM students and teachers. We add a special mahalo to Deborah Kula, CyberLancers mentor and Sacred Hearts Academy mathematics teacher, for continuously working to provide these outstanding opportunities for students like Ashley to not only shine but further their interest and knowledge in cyber security and computer science. When the command came to “go” at 4 a.m. on February 20, the Academy’s aspiring computer “techies” were “off and running” in the inaugural #GirlsGoCyberStart challenge! The 15 teams of Lancers in grades nine to 12 joined over 5,700 other students from across the nation on this week-long cyber “quest.” Their goal was to tackle fun and interactive online challenges as “cyber protection agents” tasked with protecting an important operation base. In the process, participants explored the exciting worlds of code-cracking, cyber security tools, security flaw detection, digital forensics and more. While all of the Academy’s cyber protection agents displayed superb security skills, two teams – the CyberBeans and Yikes the CyberGhosts – scored in the top 100 in the nation out of 2,355 teams and were sixth and seventh among Hawai’i competitors. Kula remarked, “Many participants in this program came from the Cyberpatriot teams, but many had no prior experience. This is a testament to all of our students being encouraged to take risks!"